Kookaburra Yoga offers yogic food classes, retreats, recipes and resources. 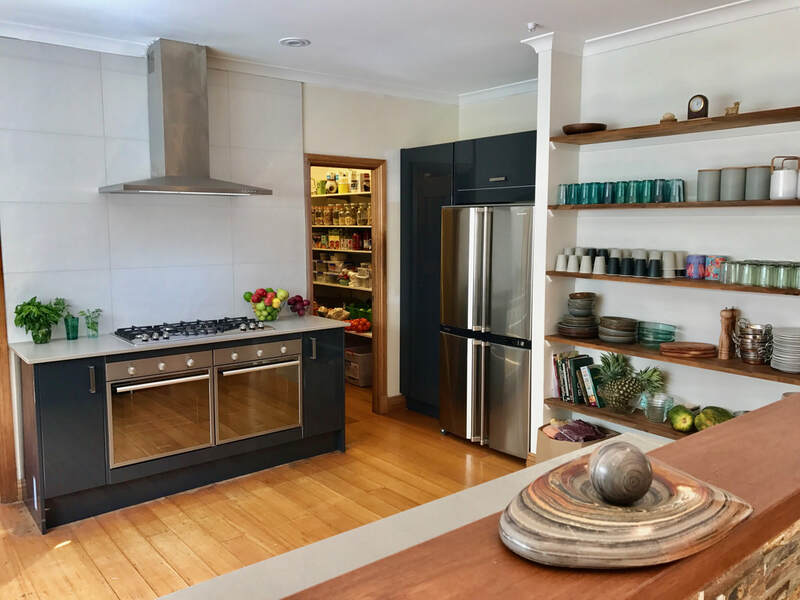 Yogi's Kitchen is a recent addition to the Kookaburra program, but in many ways has always been an integral part of our retreats - with the sumptuous, vital vegetarian food being a surprising highlight for many people. ​Food is so integral to our physical, mental and even spiritual wellbeing, and a 'sattvic' diet is fundamental to the yoga lifestyle. Learning to prepare nourishing, life-giving foods can be easy, and is one of the greatest gestures of loving kindness you can give to yourself, your family and your community. We go deeply into the philosophy and theory of spiritual nutrition, and over 6 lessons cover: Ayurveda approach to Food; The Yogic Diet - Sattvic Foods; Healing & Cleansing Foods; Pranic Foods; Rainbow Chakra Foods; Sweet Soul Foods. Each week we'll show you how to prepare a multitude of wonderful dishes, provide you with recipes and resources, and share a delicious lunch to delight the senses, nourish the body and feed the soul. Classes can be booked as a 3 week course, or as individual sessions. ​OR book 1 class for $80. Advance booking online is essential. The yogic diet is vegetarian and includes foods which are nourishing, natural and appealing to the 5 senses. In this course you'll learn about 'sattvic' (peaceful) eating, determining your unique constitution and the foods and diets which suit you best. You'll also learn about the yogic food pyramid (a little different to what you might think! ), the 6 tastes and how to combine them to delight the senses, foods which cleanse and help heal the digestive system. You'll learn to prepare delicious, aromatic vegetarian dishes including dahls, kitchari, juices, spice blends, spiced teas and desserts. We finish each week with a wonderful feast! Week 1 Health (15 June): Ayurveda: understand your constitution and an approach to food which supports your health. Learn about vegetarian grains/protein sources. Learn to make spice blends, vegan, plant-based main dishes including dahl and aromatic curries and also chai tea using your own spice blends. Week 2 Peace (14 Sept): Yogic diet: eating for peace & longevity. Learn about 'sattvic' foods. Learn to make plant-based mains, desserts, kadha herbal tea and dishes to delight. Learn about 'sattvic' foods, mindful eating, and the ethics of food. Week 3 Healing (7 Dec): Healing & cleansing foods and regimes. Learn the Ayurvedic and Yogic dietary approaches to fasting, healing and recovery. Learn to make nourishing kitchari, condiments and immunity-boosting teas. Book each class individually for $80 each OR book course of 3 classes for $200. It is possible to combine and prepare an amazing array of plant-based ingredients into wonderful, sumptuous dishes which will please and delight everyone at your Christmas table! All dishes are vegan, gluten-free and can be further modified to cater to allergies and intolerances. You'll learn about vegan foods including the herbs, spices and garnishes which transform dishes into colourful, delicious, healthy masterpieces you can share at any festive occasion. Each class includes a buffet style lunch. Week 1 Prana, Plants & Life Force Eating, 3rd November: learn about building and sustaining your health, vitality and wellbeing through unlocking the lifeforce inherent in plant-based food. Learn about 'pranic' foods and how to activate, grow, prepare and present incredible plantfoods - including sprouted yeast & grain-free bread, vegan cheese (almond feta, macadamia ricotta), vegan chocolate mousse, colourful, festive warm and fresh salads, zesty dressings to enhance digestion and a delicious ojas building dessert. We also cover seed activation, sprouting, growing micro-greens and you'll leave with seeds to get started! Week 2: Rainbow Foods Chakra Healing, 10th November Learn the theory and practice of healing through food and daily routine. We use beautiful, colourful, nutrient-dense and living plant foods to balance and heal not only the chakras, or our energetic field, but every aspect of body, mind and soul. We also consider our daily routine 'dinacharya' and approaches to attune our days and lives to the wisdom and rhythms of nature. We'll make a multitude of healing dishes to delight the senses - from grounding, heartwarming mains, to high-vibration elixirs and desserts. Week 3: Soul, Festive foods to Share, 1 December Christmas-themed vegan dishes and desserts. Learn how to make vegetable, legume and nut-based cooked festive mains dishes and plant-based cream, desserts including Christmas cake, cheesecake the whole family will love! Classes can be booked separately $80 each or as a course ($200). Kookaburra Courses have been developed by Mandy BeckerKnox who has over 25 years teaching experience, has studied directly with renowned teachers, studied Ayurveda and also spent considerable time in the kitchens of India learning the culinary secrets of the ashram cooks, street vendors and householders. Kookaburra Yoga's integrated system of Hatha and Raja Yoga includes practices which are holistic and beneficial on every level of being, bringing about internal balance and peacefulness. You learn not only the postures and practices of traditional yoga, but also what constitutes a yoga lifestyle and how to meaningfully and authentically integrate yoga into daily life. Established, reputable business. Kookaburra Cooking Courses were developed and are taught by centre director Mandy BeckerKnox. Kookaburra Creek Yoga Centre is well established having been operating for twenty years. Quality content. Kookaburra Yoga's Courses draw upon the knowledge and wisdom Centre Director, Mandy BeckerKnox, has gained through her personal study and practice of yoga and training she has undertaken in the fields of traditional yoga, Ayurveda, tantra, yin yoga. Course content is a balance of traditional yoga with modern perspectives from contemporary, relevant and increasingly research and evidence-based sources. Experienced teachers. Mandy and Robert are both exceptional yoga and meditation instructors with decades of continuing education, self-enquiry and practical teaching experience. They have literally taught thousands of people yoga and to meditate and how to effectively apply the knowledge gained to enhance and transform lives. ​Value for money. We believe Yoga should be affordable and accessible for all. Our prices are generally well below the industry standard price in Western Australia. Socially and environmentally responsible. We care for people and the planet. Kookaburra Creek is an eco-conscious venue drawing on its own and natural resources including solar power, rain and spring water and our own organic food gardens. Personal development. Kookaburra Yoga provides a wonderful opportunity for personal and professional development. You'll be gently guided to explore limitations and obstacles to achieving your potential and become equipped with the tools, techniques and practical wisdom to evolve and grow. Do I need experience in Yoga? No, we welcome anyone who is interested in learning the foundation of yoga and meditation. The yoga and meditation practices are carefully explained and taught in a caring and respectful manner. All of the practices taught can be adapted to suit the needs of each participant. We welcome everyone, regardless of prior knowledge of or experience in yoga. If you have any injuries, are pregnant or have medical conditions or concerns please include these on your booking form to ensure your teacher is aware. In some instances this course may not be suitable. Kookaburra Creek Yoga Centre is located at 210 Carradine Road, Bedfordale WA 6112. This is approximately 40 minutes drive from both Perth and Fremantle and only a few minutes drive from the Armadale town centre. Kookaburra Creek is not accessible by public transport. The nearest train station is Armadale. This is a 40 minute walk. What if I Need to cancel or miss a class? If you have paid for your course in advance online (through our paypal payment gateway) and you need to cancel prior to commencement of the course you will receive an immediate refund of the full $180 fee. Full payment of course is $180 which is payable online in advance. You can pay securely using our online booking system. Payment options are credit card, PayPal or direct deposit. We don't have eftpos facilities at the centre so can only accept cash on arrival if you choose that payment method. If you are experiencing financial difficulty please be in touch with us directly as we can organise a payment plan for you. WHAT If I have an ILLNESS or am pregnant? If you have a food allergy or intolerance please include details of this on your booking form. There are no requirements to bring any equipment to this course.